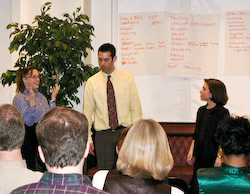 Using a combination of interactive improv exercises and facilitated discussion, we create workshops designed for corporate participants that address your business needs and link to your goals. The results are unique, engaging workshops that challenge employees and have lasting impact. Throw us into an over-air-conditioned hotel conference room with unflattering lighting, and you'll forget you didn't get to sight-see in Orlando. We constantly work with our clients to build new training programs—if you don't see what you're looking for, contact us and together we can develop some inventive ideas and solutions. Whether you've got an intimate office of 15, a division of 50, or a company-wide initiative of 800, our expert facilitators can work with you to develop a breakthrough workshop.